On starting up your pond filter or after deep cleaning, use a starter bacteria to quickly boost the important biological function of the filter. Fresh tap water may look crystal clear, but initially lacks the required chemical stability to be suitable for life to flourish. Vital natural bacteria is required to breakdown the harmful organic by-products of life in the pond. BioKick Filter Starter introduces an instant dose of these cultures which would otherwise take a number of weeks to populate naturally. Fresh water also contains chlorine which is harmful to fish pond life. 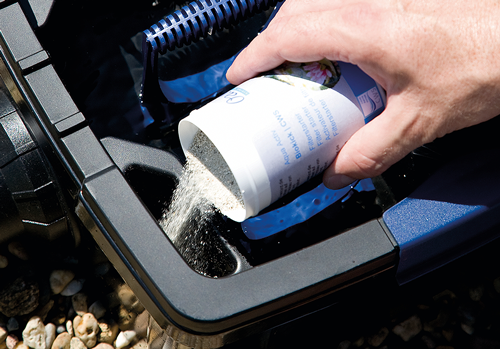 AquaMed Safe & Care can be introduced to new pond water to instantly purge out chlorine from the water. A Tap Water De-chlorinator System can be installed in line between tap and hose to remove immediately remove chlorine from pond top up water.